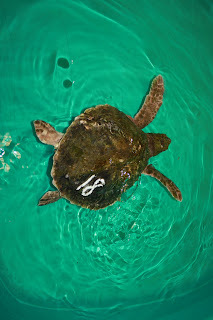 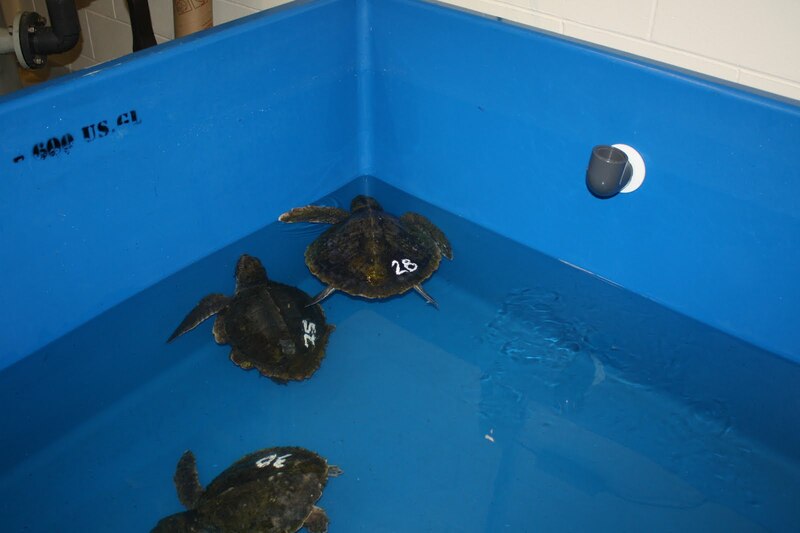 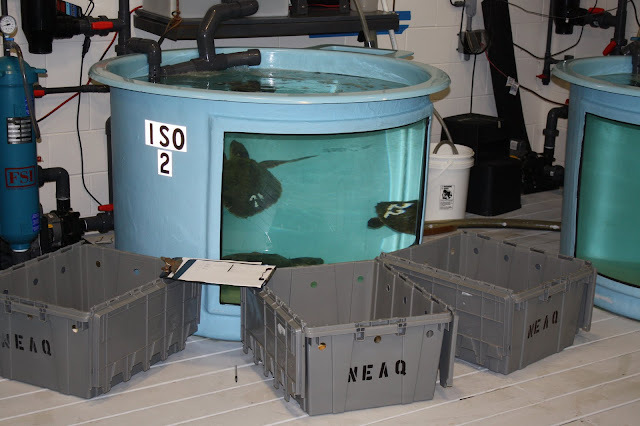 Yesterday we received our eighth sea turtle of the 2011 cold-stun season. 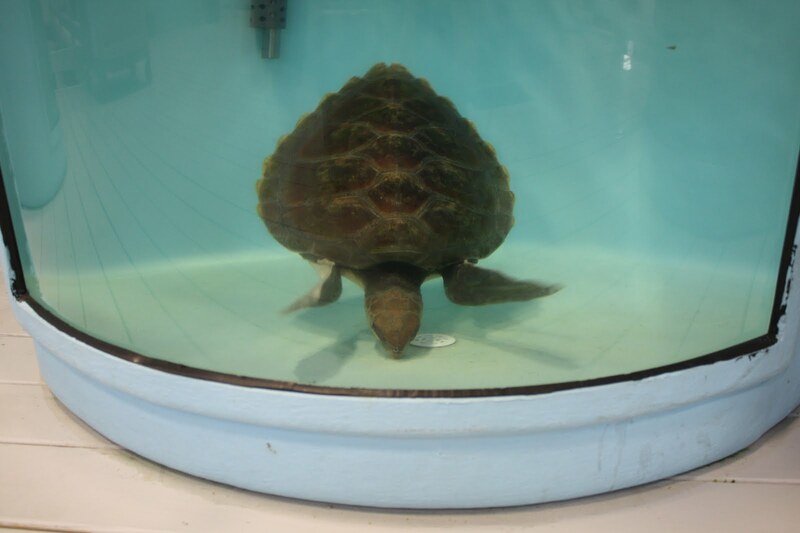 This turtle arrived at 65F from Eastham, MA. 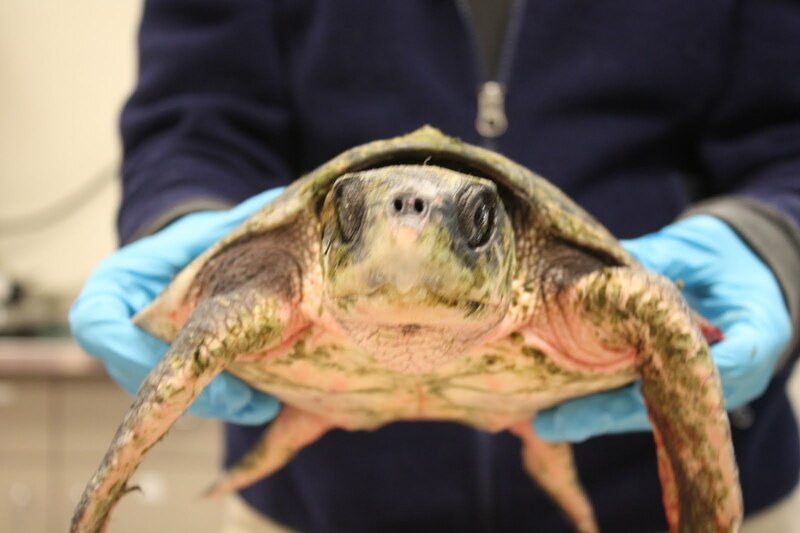 We were told the turtle was found trying to get back into the ocean and was able to be saved and brought to the Wellfleet Audubon. We are definitely getting pretty original with our name of Hybrid for this sea turtle. 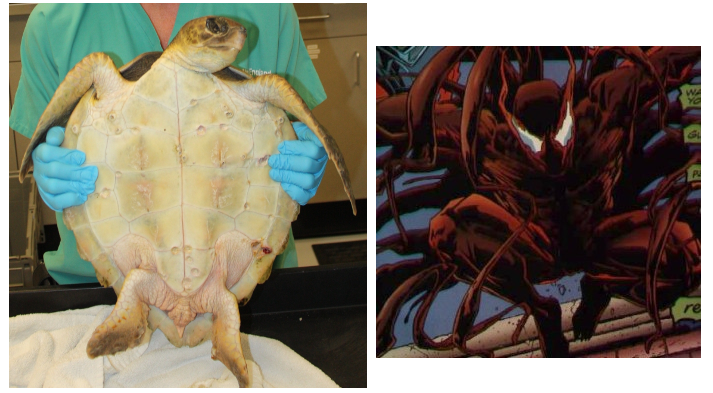 Left is the turtle, right is Hybrid from the Spider-man series. Other turtles this season have been named Rorschah and Doomsday. 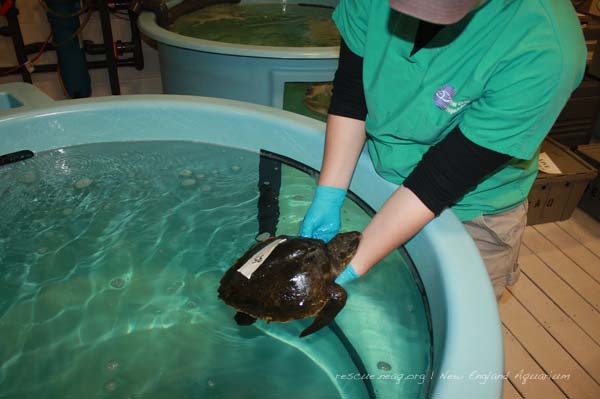 Wellfleet staff member Tempe holding Hybrid! 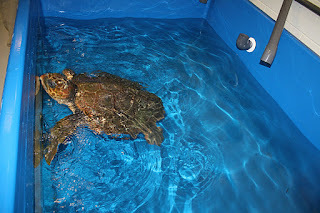 Tempe from Wellfleet brought the turtle up to us. 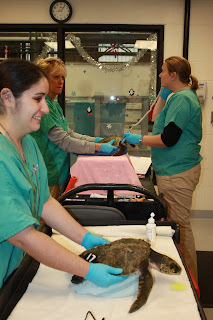 It was very active on the ride up and during the exam. 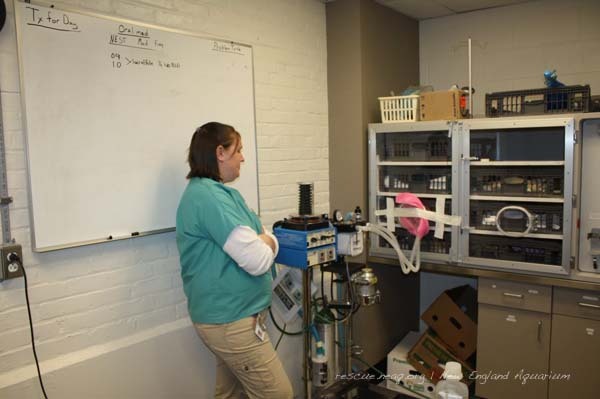 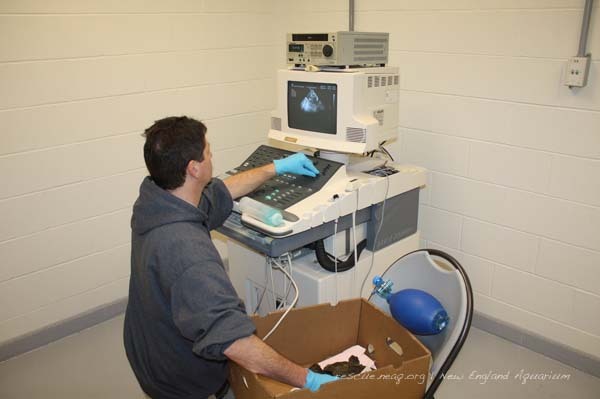 Above Left: Intake exam. 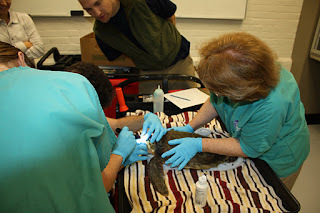 Looking into the eyes to make sure there are no abrasions or scratches. 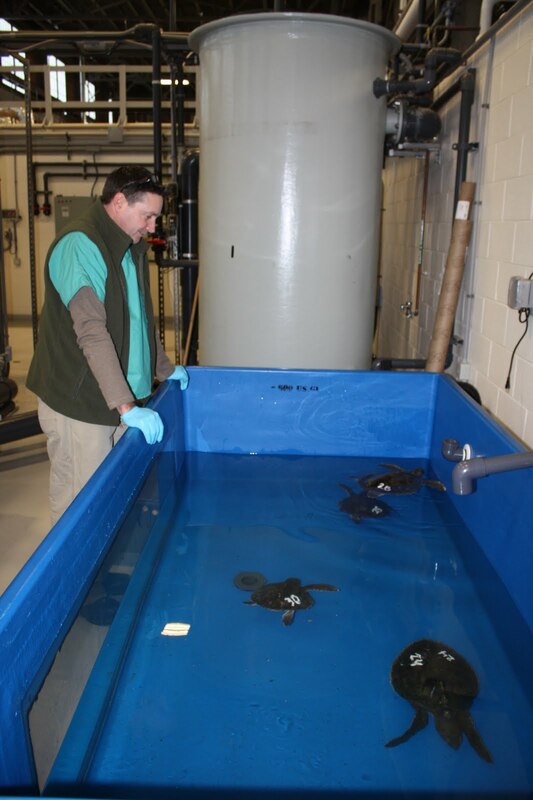 Above Right: We had already started removing the algae and sand from the carapace to look at scute counts. 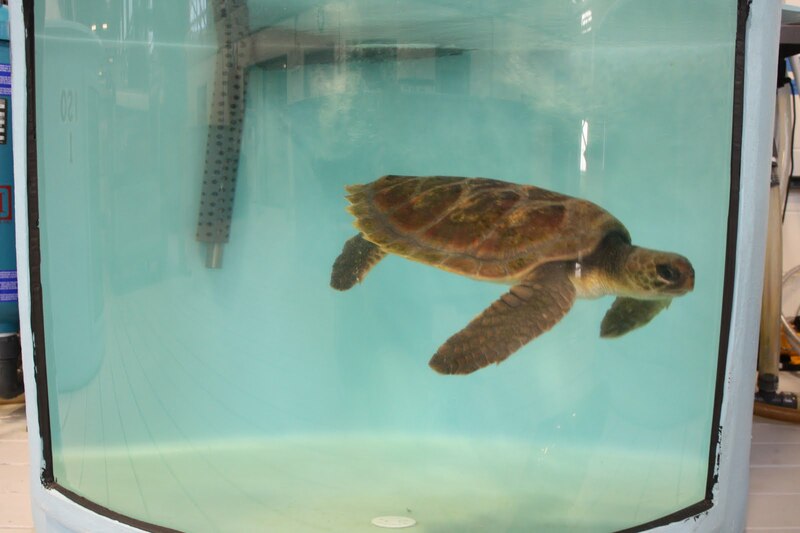 As we started our intake exam the coloration appeared to make this turtle a loggerhead. 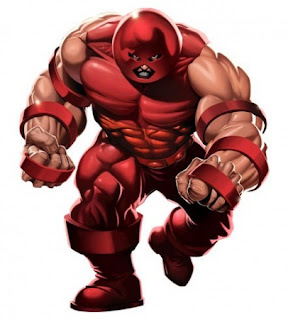 BUT... the head and neck just didn't seem right. 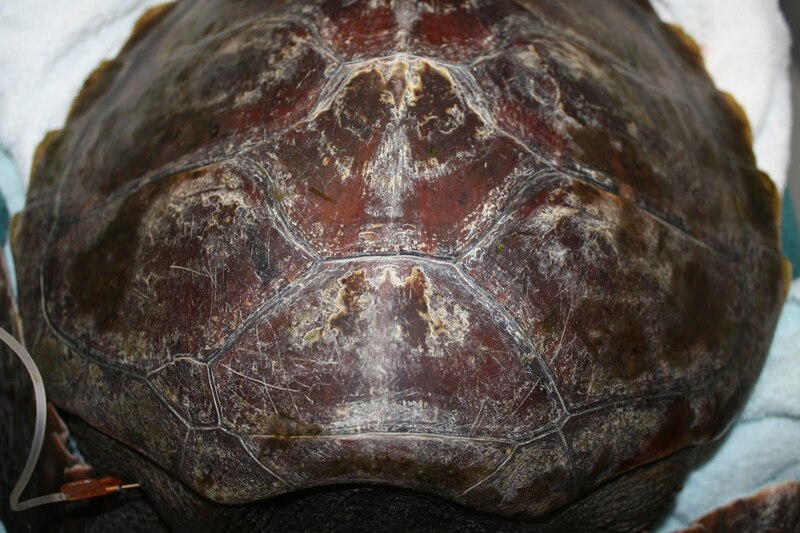 So prior to getting a photo with all the mud and algae still on the carapace (top part of the shell) we started removing the epibiota to start counting scutes (scales)! 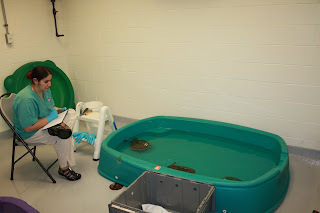 Photos showing how we determine species of a turtle if we aren't positive. 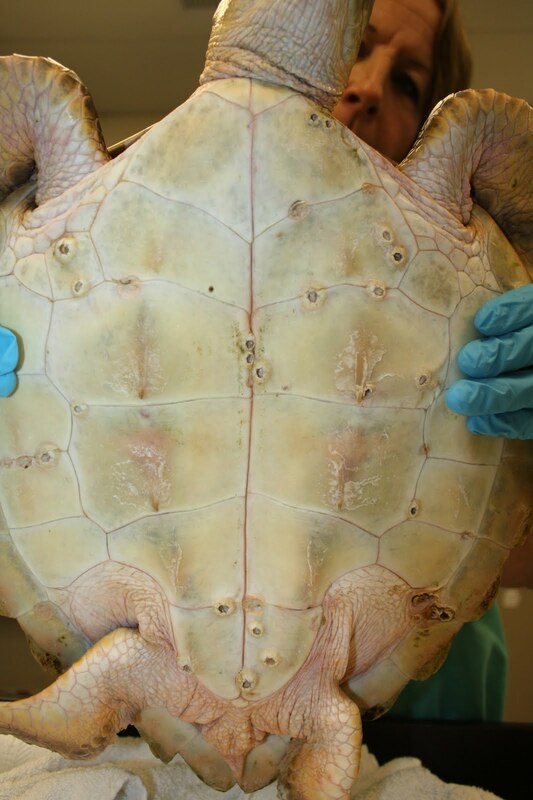 Why do we think this turtle is a hybrid? 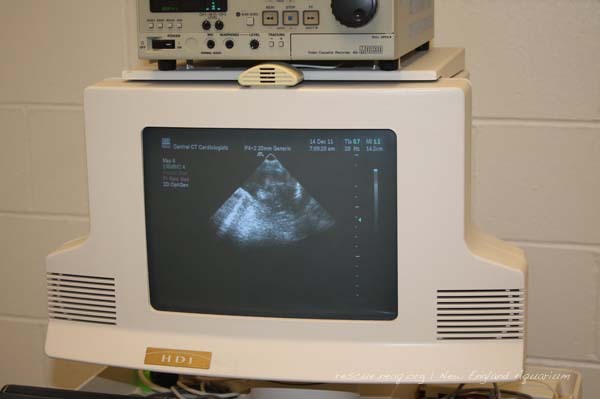 In the photos above you can make out several odd characteristics. 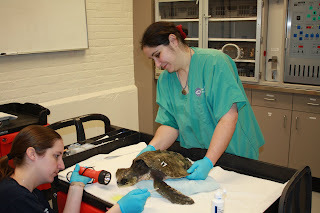 The photo on the left shows the first vertebral scute touching the nuchal and the 1st left and right marginal scutes. 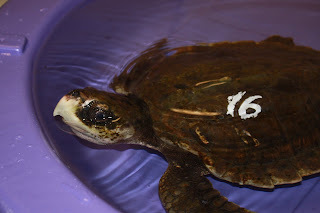 This is characteristic of the green sea turtle not loggerhead. 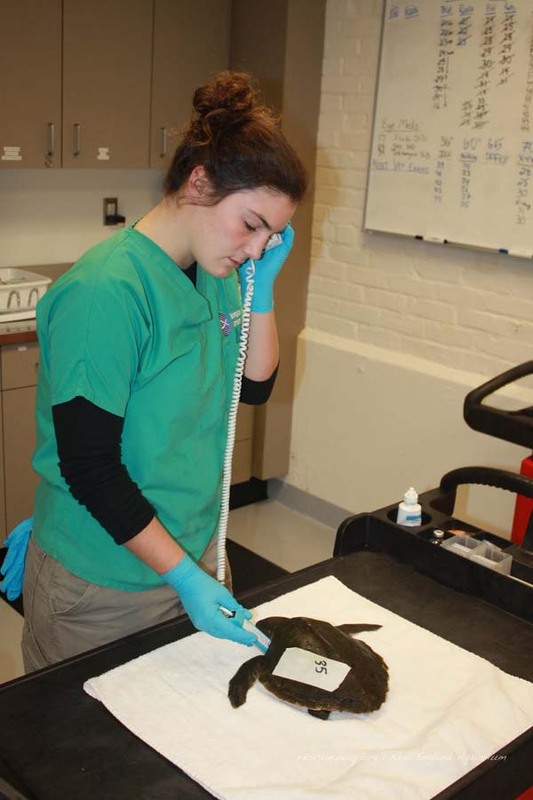 On the right the scales between the turtle's eyes are called prefrontal scales. 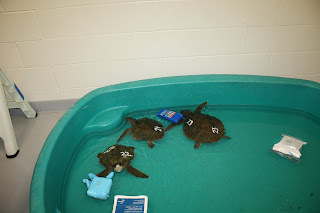 This turtle only has two of them. 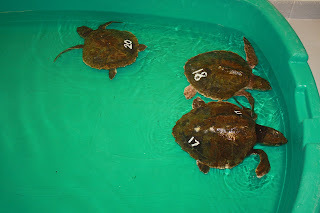 Only green sea turtles and flatbacks have two. Flatbacks are only found in the warm tropical waters around Australia so we can be sure it is not one of them. 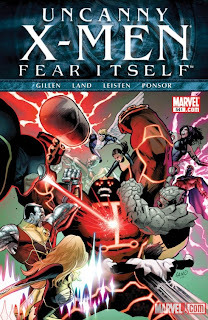 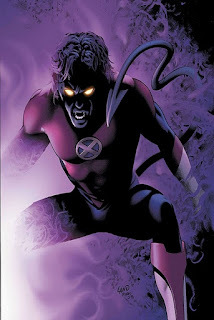 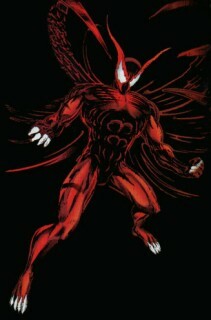 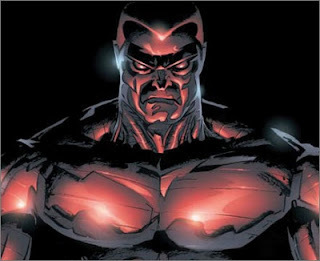 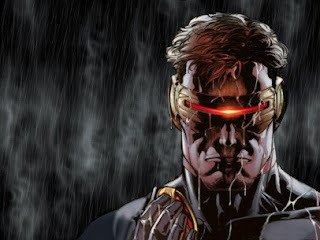 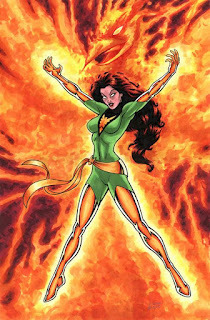 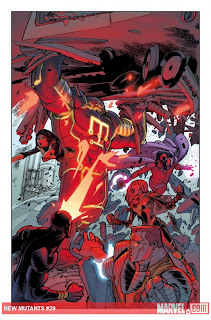 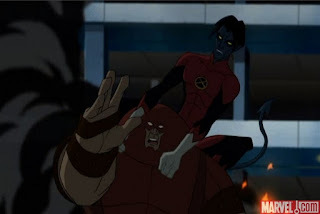 Above left another photo of Hybrid from the marvel wikia page. Those abs of steel look like a turtles plastron and its scutes! 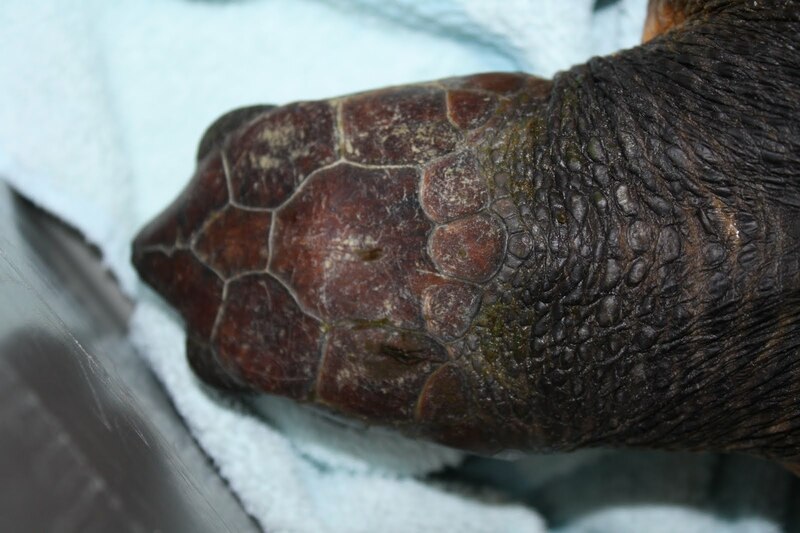 Above right you can almost make out the inframarginal scutes under the gloved hands of our volunteer Pat. 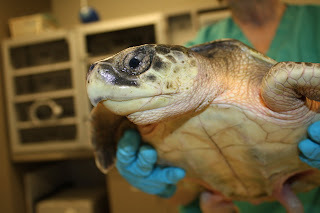 The count on those could make this a green or Kemp's ridley species of sea turtle. You may also notice the barnacles on the plastron. 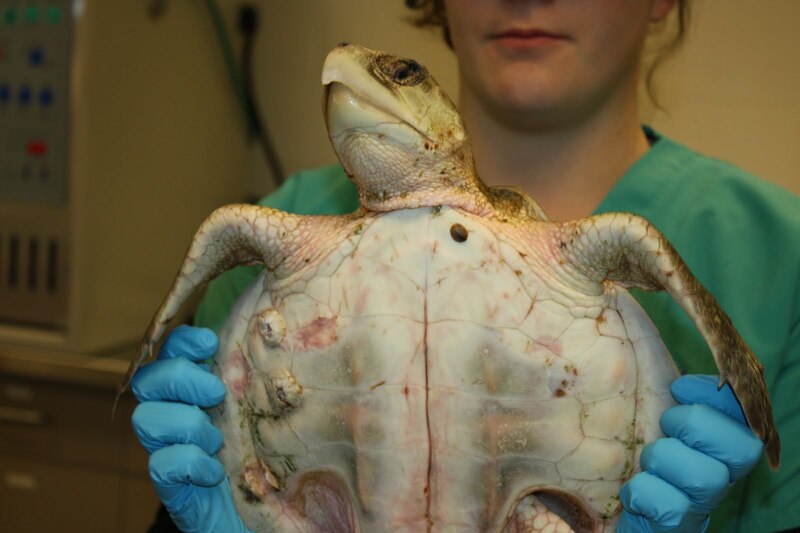 We have been able to remove almost all of them. Above: Two of my Tuesday volunteers, Pat and Mary, work to clean off our new turtle. 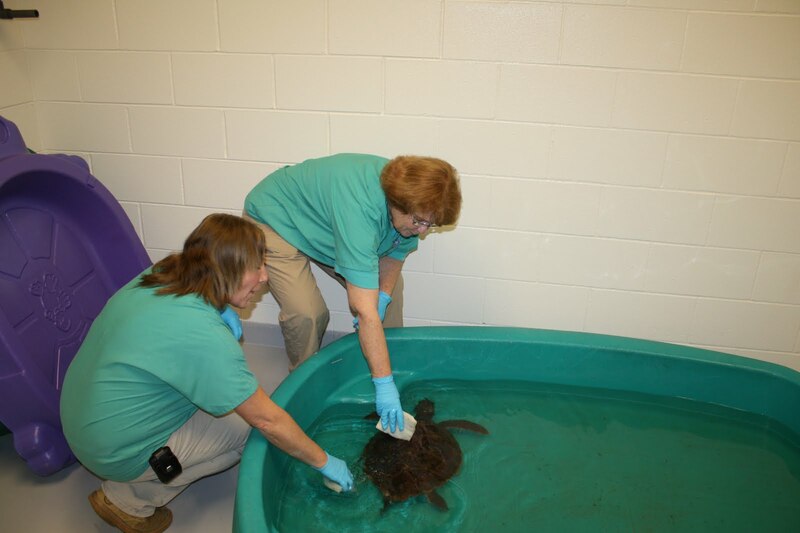 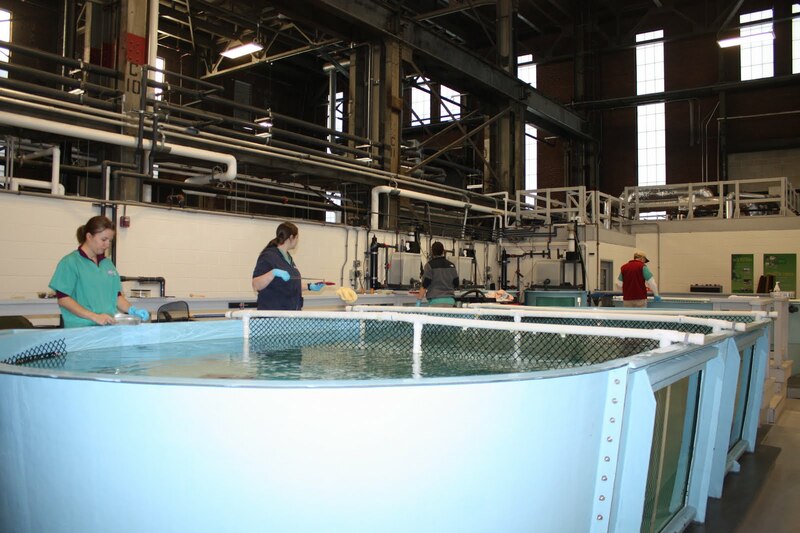 During the first turtle swim we were able to clean off most of the algal and mud cover on the carapace. 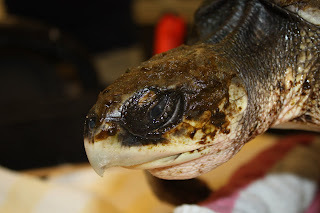 What is the turtle? 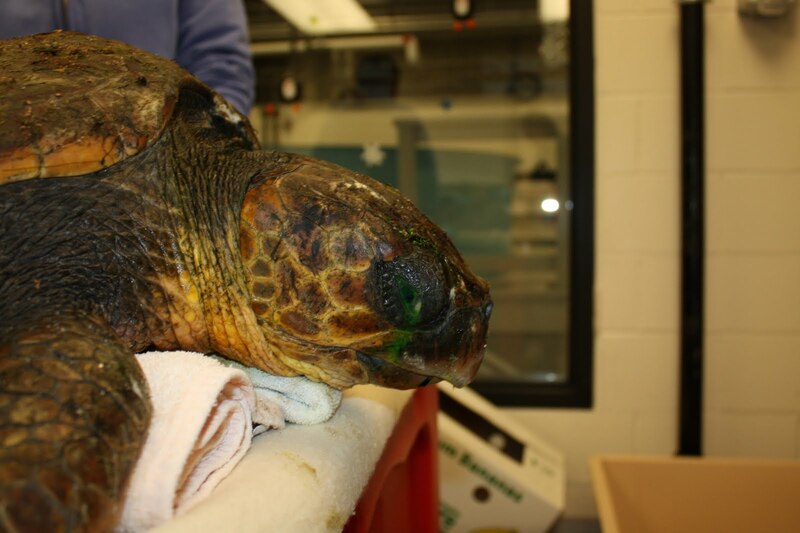 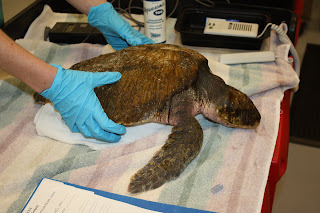 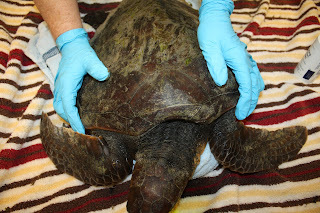 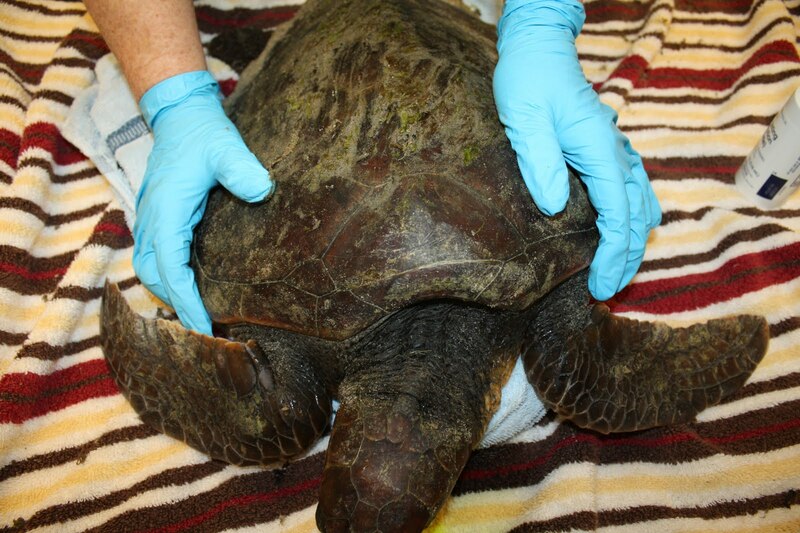 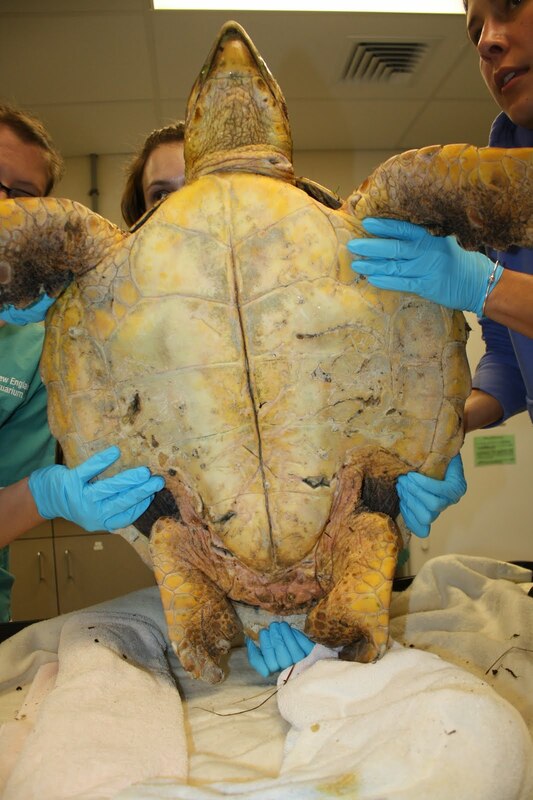 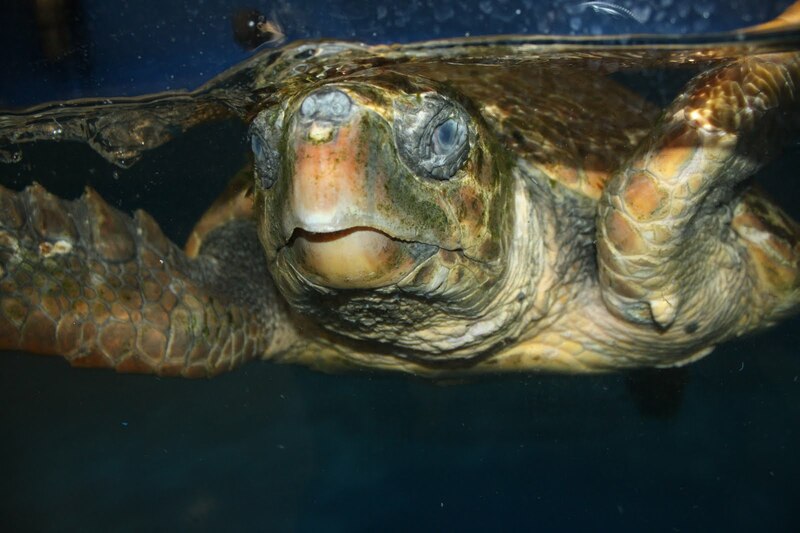 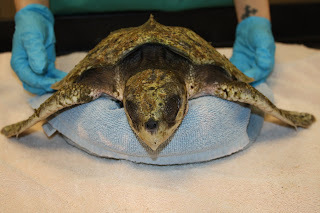 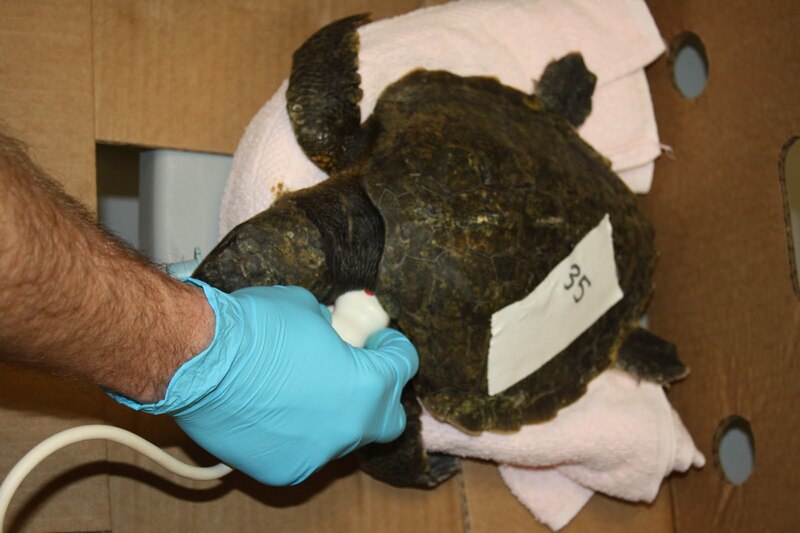 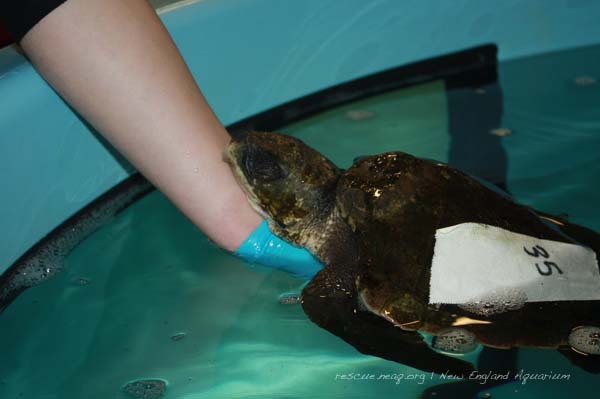 Is it a loggeridley (loggerhead X Kemp's ridley, like this 2009 patient), a groggerhead (Green X loggerhead) or a gridley (green X Kemp's ridley)? 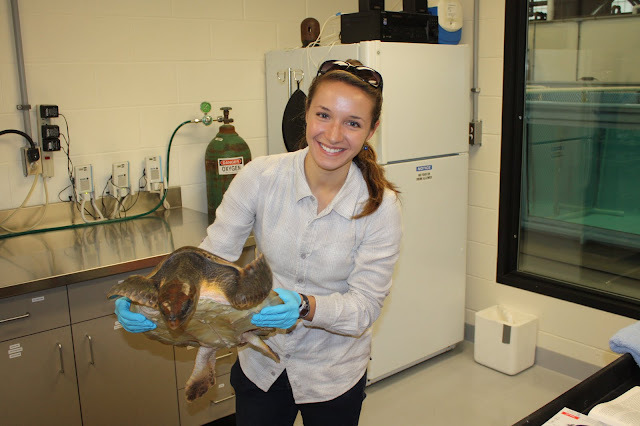 We will be sending genetics samples off to NOAA so they can speciate this turtle! 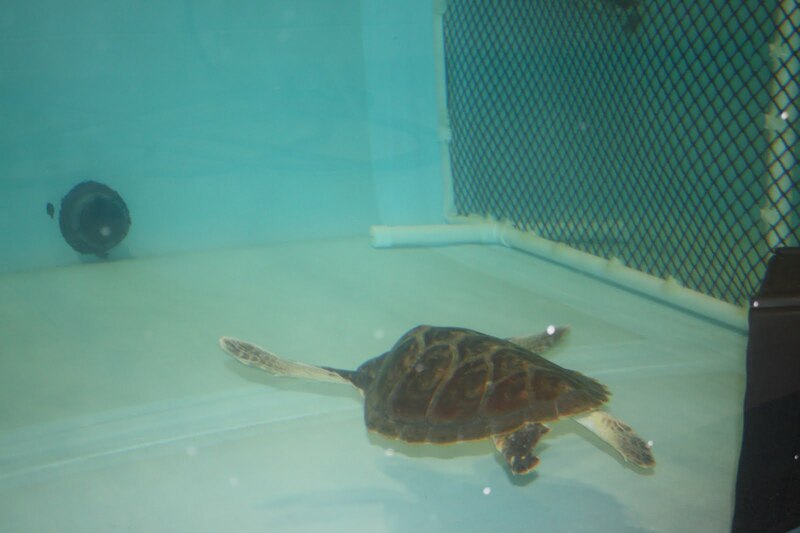 Today this turtle is in one of the bigger tanks and doing great!